Connor's 'lipstick foam' lips after our ride Monday. Woo hoo! For the first time in my life, I am able to automatically take stock of Connor's body and reactively apply the correct aids at the correct times in order to get exactly what I want out of him at a given moment. This is why I've completely changed my perception that well-trained horses have "buttons" to well-trained horses are sensitive enough to respond to the rider's expertly-applied aids. I will never be an expert with the timing and placement of my aids, but they are getting more sophisticated, and now that Connor and I are speaking the same language, the results I am getting are better - no buttons required. On Monday my trainer arrived for night chores right as I was finishing my ride on Connor. "How did it go?" she asked. "Really well!" 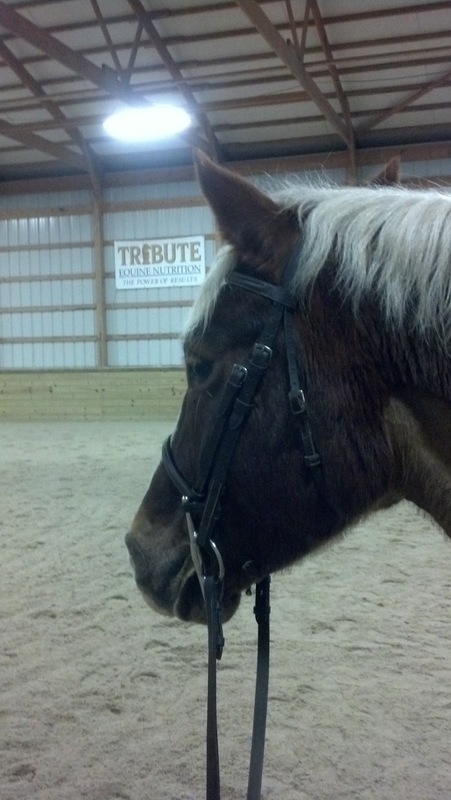 I said, "I'm finally able to get the kind of canter transition on my own that I can get during a lesson with you." She laughed, so I continued "Seriously! It takes me like six weeks after a breakthrough with you to be able to get it on my own." I worked on the canter on Monday, keeping in mind the mantra "No rein aid without also a leg aid." My biggest problem in the indoor is that when I give a half-halt, he breaks, so I never learn how to put the canter together. So, I put together the information from the awesome outside ride with that mantra from a lesson several months ago and figured out that I am riding with too much hand and not backing it up with any leg, causing him to break if he's not feeling motivated to move forward like he is on hacks. Lightbulb moment six months in the making; seriously, I am slow. 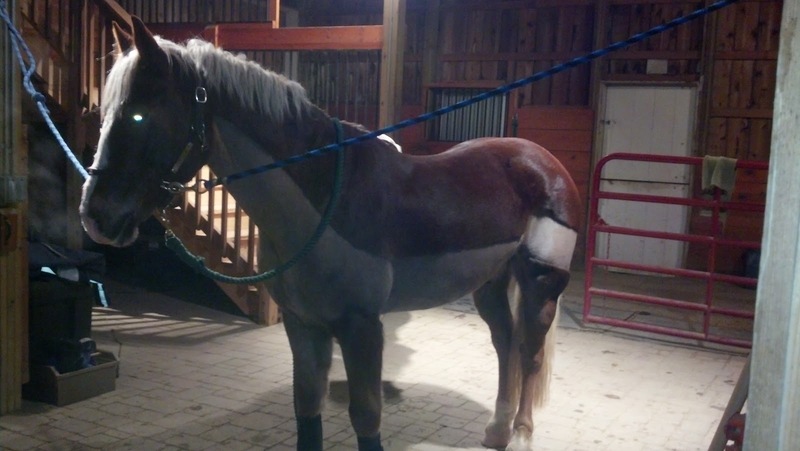 On a 20m circle, I would establish a good, forward trot, do several trot-walk-trot transitions to get him sharp off my leg, then as I was heading toward the wall, I would give him a strong half-halt on the outside with my outside leg a bit back, then apply inside leg to keep him out and ask. When I did that, it went great. Like Cathy said, I did not get caught up in asking at a particular place or time, but I waited until I had him ready no matter how long it took, and when I did all of that, it was just as good as it was in lessons. No buttons, all skill, good pony. "well-trained horses are sensitive enough to respond to the rider's expertly-applied aids." -- that's a great observation! Yah! Well done. I love those light bulb moments. Look forward to the pics when you guys are showing! He does look sooo good, and love this post because it is all so true! You guys are making so much progress, it is awesome! I can totally relate to the get it in lessons but not outside as well.